Now we’ll take a look at the ‘void,’ or ‘free’ mind, something much misunderstood even though it’s an important matter, the heart of the Buddhist religion. There are those who misunderstand the ‘void’ mind concept, those in opposition to it, those who make a joke of it, those who criticize it, those who slander, say unpleasant things, those who pretend that it’s something bad, and so on. There are some who say that the mind can’t be void, that there must be some thinking, that if the mind is void there won’t be any thought so that the body will be like a piece of wood and incapable of doing anything. We say, however, that all activities should be done with a void mind, but some people don’t understand that. There are even those who claim that if the mind is void of ‘me’ and ‘mine’ then there’s no-one to be responsible for anything, no-one to try to do anything, to develop anything, and that we’d be somehow imperfect as people because of that. Some also say that if the mind is void there won’t be any patriotic feeling, no regard for religion, even for our own family. There are those who charge that the void mind isn’t a Buddhist principle at all, rather it’s something made up by the writer to fool people with. So, we can see how this concept is misunderstood, even though it’s very important, because people need to be aware that if the mind isn’t sometimes void then the results can be terminal. People survive because the mind is void from time to time and they can rest, can relax. If mind’s troubled, depressed by the feelings connected with the ‘me’ and the ‘mine’ then madness is a possibility, or some nervous disease, and, if the mind can’t stop, can’t relax at all there could even be death. This is something we need to know - that we can survive in a reasonably sane manner because the mind naturally experiences voidness from time to time, and at such times there’s physical relaxation, contentment, and the mind’s best able to think, to function. Now, the ‘void,’ the ‘free’ mind, we’ll split the matter up into three: voidness by way of samādhi; voidness by way of vipassanā; and voidness by way of nature, the voidness that happens quite naturally. The voidness of samādhi occurs when someone is in any level of jhāna. When fully concentrated there’s freedom from defilement and the mind is fixed on the components of the jhāna, or on the sign of concentration. At such times the ‘self’ thought is absent, there’s no thinking that ‘I’ have entered jhāna, or that ‘I’m’ concentrated, if there is then there’s no possibility of it really being samādhi. So we need to forget the ‘I’ completely and leave the mind to fix on the nimitta, on the object of samādhi until the factors of jhāna arise fully. In all levels of jhāna the mind has the characteristic of being free of the ‘self’ idea. In the Pali it’s called ‘inner voidness,’ that is, there isn’t anyone doing the knowing. This is freedom. At such a time there’s no defilement, no nivarana (the obstacles to concentration are ‘put to sleep,’ as it were), the thoughts of ‘me’ and ‘mine’ are absent and there’s concentration. In this kind of experience there’s contentedness, purity and stability, but there’s also agility of mind (kammaniya), that is, mind is nimble, quick, able to do its proper duty. Such a mind can do anything well. If mind isn’t like this then it isn’t samādhi and won’t be able to function properly. Hence we can work with a void mind, especially where it involves the mental work connected with attainment of the path, fruit, and nibbāna. It’s said that if the mind’s not void, not free then it’s not samādhi, and if it is samādhi then that’s freedom in itself. This is the mind made void by way of samādhi. Now, this ‘me’ and the ‘mine’ belief, is it right, or is it wrong? Do we believe in something that disagrees with the truth of nature? Well, Dhamma represents the fundamental truth of nature, and the truth of nature is that everything is actually dependently arisen. When we manage to ‘see’ in this way then we know that all things are void of ‘self,’ that there’s only the flowing on and spinning around of paţiccasamupannadhammas dependently arising and ceasing without end. If we see like this then we see voidness by way of vipassanā. If we have true wisdom we’ll see all of the forms, sounds, smells, tastes, touches, and mind objects, all of those sense objects as dependently arisen, as void. So, don’t fall in love with anything that’s void, don’t fall for the beautiful forms, sweet sounds, fragrant odours, delicious tastes, soft touches, and the sort of feelings that delight the mind. Know the sense organs, the eye, ear, nose, tongue, body and the mind as being void too. In reality the eye isn’t self-existent, doesn’t have a ‘self,’ it’s basically the natural element called the rūpādhātu, the material element, which forms the eyeball, the nerve of the eye, and everything to do with the organ called the eye. Then there is the wonderful element called the ‘viññānadhātu,’ the consciousness element which, whenever the eye sees a form will come to do its duty, will arise to know the seeing. This is the way it is according to nature. There isn’t a ‘self’ who sees, there’s just the seeing taking place according to basic, natural principles: because there is the eye which is complete and there is an external sense object, that is, a visible object to meet the eye, then the consciousness element will come and do its duty at the eye, and the eye will see the form. The particulars of that then go to the mind to be processed. The mind, however, isn’t a ‘self’ either. If we know in this way then we know voidness through the vipassanā method. Observe anything, observe all things together, observe them separately, observe the body internally, the body externally, observe other people, the whole world. When we see this internally then we’ll see it externally too. If we see voidness in ourselves we’ll also see it in others, we’ll see how this world is void, how other worlds are void, we’ll know voidness by way of the clear understanding that’s born of wisdom. Now, the voidness that occurs naturally. Here we need to understand that the ‘normal’ mind - the mind when there’s nothing interfering with it, when it’s without the nivarana, the hindrances, without the kilesa, the defilements - is ‘luminous.’ At such times it could be called the ‘original mind,’ as it was in the womb. The intermittent disappearance of that luminosity happens because defilement enters bringing with it the feelings of ‘me’ and ‘mine.’ For example: mind meets anything that causes satisfaction and there’s desire, taṇhā, then there’s clinging, upādāna to the idea that there is a ‘desirer,’ a ‘me’ who desires. It’s in this way that the ‘self’ sense arises, that there comes to be a ‘me’ who desires, who desires to get something so that it can be ‘mine.’ ‘Me’ and ‘mine’ are really vain, nonsensical, but not in our understanding, there isn’t anyone who would allow or could easily accept that the ‘me’ and ‘mine’ aren’t realities because they’re the most powerful feelings in the minds of human beings. But observe how terrible the arising of the ‘me’ and ‘mine’ is, and recognize that they aren’t permanencies, know that they come and go, come and go, that they arise intermittently, and know that if they don’t arise then the mind’s in its original, luminous, naturally void state - and without us having had to do anything at all. If there isn’t any reason for the mind to lose it’s luminosity then it will be in it’s original state quite naturally, it will be naturally void. So, the free or void mind can arise in different ways: void because of samādhi, void through vipassanā, or void because it’s returned to it’s original state quite naturally. However, it needs to be said that the samādhi mind - the void mind fixed on an object of samādhi - still feels, so it’s not that there isn’t any thinking; at that time there’ll still be feeling so there will be some form of thinking too. The mind void through the power of vipassanā considers, investigates, penetrates, intuits into the reality of things, so it isn’t ‘void’ in the way that a stone, for instance, would be. The luminous, the original mind still thinks and feels too, but without the defilements it’s naturally clean, unblemished and can think and feel in the way natural to it. The Pali word for ‘mind’ means ‘think’ so if the mind can’t think then it isn’t really a mind at all, thus ‘void’ here doesn’t mean that there’s no thought or feeling, it means void, or free of the sort of feeling and thinking that causes trouble, that brings upset. After all, who likes trouble and strife? The troubled mind can be compared to a fire, in that it’s hot in the way of being tense, unbalanced. Now, who likes that? Who likes stress and tension, trouble and strife, unhappiness, depression? Nobody at all! That stress, trouble, depression is a ‘me’ and ‘mine’ affair, and when ‘me’ and ‘mine’ are gone then there is the ‘normal’ mind, a mind without stress, without depression. This mind we call ‘void,’ but it’s not void in the same way that a stone would be. The normal mind is contented, cool, a useful mind, and, better still, it’s able to understand everything deeply, to know aniccaņ, dukkhaņ, and anaţţā, to know the deep dhammas, and thus is able to escape from suffering. Hence the mind free from the defilements, from the feelings of ‘me’ and ‘mine’ is very useful because it allows us to live contentedly, to think well and clearly, to advance in deep matters so that we can, perhaps, realize nibbāna, or - if we prefer - come to know god. Consequently, we consider this to be important, necessary knowledge, which is why we offer it to you. There’s another form of naturally occurring ‘voidness’ which manifests when we sleep, because at such times the mind is void, but as there’s no thinking when we’re asleep then it’s another kind of voidness, not the one we want here. Dogs and cats can experience this kind of voidness too, so it isn’t a matter of skilful, virtuous living, nonetheless it does help life to be restful, relaxed and not too crazy. This sort of voidness, however, isn’t enough to normalize the mind, for that to happen it needs to have the voidness that arises through it being well and correctly controlled in accordance with Dhamma - through not allowing the nivarana, the kilesas to arise, because if the mind is full of defilement it can’t rest, there’s sleeplessness, and there can be madness. The nivarana and kilesa cause sleeplessness, bring a shortfall in rest and relaxation, and such a state of affairs can end in insanity or death. So recognize that voidness is a necessity, something human beings must have, something that sustains the mind, allows it to be normal, to be cheerful and bright, to grow and prosper, to be luminous, to become superb. Whenever the mind is fresh and bright, cool and happy, peaceful, then take good note of it because this kind of mind is without the defilements, it’s not being worried by the ‘me’ and ‘mine.’ Perhaps when we know this void mind as something beneficial, then we’ll try to sustain it. So, it’s not that the void mind doesn’t think about or feel anything, that it doesn’t feel responsibility, doesn’t recognise good and evil, or whatever. That’s a counter-argument of the foolish void-mind contingent - because there are those who really don’t understand this at all and talk about the sort of void mind that would, for instance, understand killing things, killing people as not being an evil matter, who make out that the void-minded would be incapable of doing anything useful, beneficial. But they misinterpret the meaning of the void mind. This, then, is the matter of the ‘free,’ or ‘void’ mind. If the mind is void there’s contentment, freedom from depression or anything of that sort; there’s normalcy, well-being, calmness, and then, when we think or do anything, we can think and do whatever we have to do well. We’ll also be in a position to experience deep truths, because when the mind is void then it’s one hundred, one thousand times more skilful than, for instance, a computer. If the mind’s troubled however, if there’s the heat of suffering, tension, depression then we can’t think or do anything particularly well. Most importantly, however, this voidness sustains our lives, if we were without water to drink we’d soon die, and, in the same way, if the mind wasn’t sometimes void, wasn’t ever free we’d soon go mad - there has to be enough voidness to slow down thinking and relieve unhappiness, to allow the mind to relax, to become normal again. If there were a depressed mind, a hating mind, a troubled mind for just one day – it would be different for different people – we could go mad, and if the mind was like that for several days then we’d probably go completely haywire and might even die, simply because we’d suffer too much. So, maintain the mind well, allow it to develop the characteristics of a ‘void’ mind. There’s voidness on all levels: mind is void of defilement, and void of dukkha, of suffering - this is worthy of our interest. The kilesa, the defilements are well known as the location of selfishness. The ‘root’ defilements, loba, dosa, and moha: loba, greed, leading to the desire to get something to be ‘mine,’ dosa, aversion, leading to desire again and, perhaps, to anger because of not getting something to become ‘mine,’ and moha, delusion, a spinning around, an uncertainty about how to act in any given situation. All the forms of defilement are a matter of ‘self.’ As for dukkha, the word has two basic levels of meaning and if they get mixed up there can be problems: it’s said that all sankhāras (anything ‘conditioned,’ anything arisen in dependence on a cause) are dukkha, which means that all conditioned things are impermanent, prone to change, and thus quite naturally dukkha. A stone, for instance, as an impermanent thing must have the characteristic of being dukkha. As for dukkha as suffering, that only appears if clinging occurs, because then it will be a matter of mental dukkha, of suffering, for whoever does the clinging. Even a stone, if we cling to it as ‘mine,’ means suffering for the mind to bear with. Dukkha in its first meaning accords with the principle that if anything is unstable, changeful, impermanent, then it’s dukkha. This isn’t mental suffering but the basic characteristic of dukkha, that which can give rise to suffering. So, ‘dukkha’ - one meaning is to have the quality of being dukkha, another is of pain in the mind, mental pain. If the mind is void it doesn’t have the suffering, the mental pain, because there’s the knowledge that all things have the basic characteristic of being dukkha and that to cling to them will be a problem. Thus there’s recognition of the benefit of not clinging, which is what prevents suffering from arising. The void mind is free from foolishness and able to think intelligently in conjunction with full mindfulness and right knowledge. When the mind’s depressed, unhappy then whatever mindfulness and wisdom we possess is forced, halting and sketchy. When mind is void, without depression, without unhappiness it has the attributes that allow it to perform perfectly: full mindfulness and a clear understanding. Foolishness comes from the defilements, from loba, dosa, moha, greed, aversion, and delusion, but sweep out the defilements completely, the mind clears up completely, and mindfulness and wisdom return to guide our activities. Thus voidness is useful, endowing the mind with the attributes that allow it to do its duties properly. Mind freed from the defilements is more mindfully aware than at any other time. Now, let’s suppose for a moment that a pill could be made for us to swallow that would produce the void mind. But even if that could be done it wouldn’t produce the sort of void mind we’re talking about. Even if scientists could make a medicine for us to take which, once taken, produced voidness, so that there was no dukkha, no heat at all, it wouldn’t be the voidness we’re talking about here, rather it would create an addiction which would prove ultimately very harmful. We shouldn’t look for quick fixes, like some kind of pill that will easily bring us the free mind, bring nibbāna, it would be madness to do that, and it can’t happen. If there’s to be the voidness of the Buddhists then it must be a matter of mental correctness. So, looking at the benefits of voidness – the voidness of the void mind, what is its value? What is its use? From what’s already been said we know that there’ll be contentedness along with the efficiency peculiar to the void mind, but now we want to point out the advantages clearly: Making the mind void will be the same as getting a taste of nibbāna, a sample of nibbāna from time to time, because whenever the mind is free from the kilesa then we get a touch of the ultimate, we experience a little nibbāna, a sample of it, just for a time, and perhaps this might happen several times during the course of one day. Hence we have temporary nibbānic experiences to sustain us. It’s necessary that we experience this form of nibbāna often enough during the day and night for us to stay reasonably normal, otherwise we’d have nervous problems and perhaps become really mad. So, having some mental freedom is the same as having a little nibbāna infiltrate life every day. We’d also have above average mindfulness and wisdom. Generally speaking, people have average mindfulness and wisdom, but if we want to upgrade, to have miraculous mindfulness and wisdom, then we need to make the mind void, let the mind be free. If we want to study well, want to speak well, to write well, to compose well, to do anything well, then let the mind be void and mindfulness and wisdom will do their various duties marvellously. Deep, wonderful thinking can happen when the mind is void of defilement, when the mind gets out from under the pressure of the kilesa. If the defilements still have the mind by the throat then there’s no possibility, no way that it can think freely, or do anything particularly well, and then even writing a letter properly will be difficult - even talking will be difficult. Hence, we’d have the power of the free mind to enable us to do our duties well. Now, here’s something funny: when the mind is void then the King of death won’t be able to find us; the King of death will search for us but he won’t find us. When the mind is freed from of the feeling of being ‘me’ it doesn’t feel that ‘I’ will die, thus it doesn’t know ‘death.’ The Buddha said this: one who has mindfulness and sees the world as void, then the king of death seeks for, but doesn’t find them. Dwell seeing all worldly things as void and we won’t entertain any fear of death, then the King of death won’t be able to find us, we’ll have escaped his grasp. Let him seek wherever he will, as much as he wishes, but he won’t find the void-minded, because such an one is free of ‘me’ and ‘mine’ and dwells ‘above’ birth, ageing, sickness, and death. In Thailand we chant about how we ordinarily have sickness, old age, and death and cannot escape them, which is true: because we’re ignorant and have ‘self’ belief then we get what we deserve, that is, we get ‘born’ to age, get sick, and die. It’s what we deserve: we have a ‘self,’ a ‘me,’ so we’re not free and have to be born in order to die over and over again. The Buddha once told his attendant, Ānanda : Ānanda, whenever anyone dwells with us as their kalyānamitta, (kalyānamitta means ‘good friend’) they, being ordinarily subject to birth will escape it, being ordinarily subject to ageing will escape from it, being ordinarily subject to sickness will escape it, being ordinarily subject to death, will escape death.’ But, how is it that we can escape birth, ageing, sickness, and death by taking the Buddha as our good friend? Well, the Buddha taught freedom from ‘self’ belief, he taught how to let go of it, and being free of ‘self’ then birth, ageing, sickness, and death may search for us but they won’t find us, that is, we won’t have a ‘self’ to be born, to age, to get sick, and to die. Make the mind free of ‘self’ and birth, ageing, sickness, and death won’t be able to dominate it. This will be a benefit of voidness. The mind free from the influence of defilement, without the nivarana, the hindrances, without the upakilesa, the defilements, without the anusaya, the underlying tendencies of mind, without the āsava, the inflows, is a powerful mind. Some schools of thought hold that the void, the free mind is an impossibility and that we must have the defilements throughout our lives, that there isn’t going to be any time when the mind will be free from them. Now, we say that they aren’t always present, because there isn’t anything that’s permanent, there isn’t anything that’s eternal, that’s truly unchanging. The defilements come and go from the mind in dependence on the causes and conditions being present, so, end the causes and conditions and the defilements will end too. Through developing sufficient mindfulness and clear understanding we could live producing the right sort of conditions, live in such a way that the defilements that would normally arise wouldn’t get the opportunity, and even the smaller problems, like the five nivarana wouldn’t happen. The mind of an ordinary, worldly person isn’t void, isn’t free because it’s afflicted by defilement, by taņhā, craving, and by upādāna, clinging, attachment. What is ‘craving’ like? Craving drags the mind here, there and everywhere. What is ‘clinging’ like? Clinging binds the mind to the object of desire. Someone who lives with craving and clinging isn’t free. Now, if we know what craving and attachment are like then we’ll also know what freedom from them is like, we’ll know the void mind. The void mind is ‘clean,’ ‘unblemished.’ In ordinary useage if something’s blemished then it’s said to be soiled, dirty in some way. In the mental world this ‘dirt’ is called ‘kilesa,’ or ‘defilement.’ ‘Kilesa’ means ‘a dirty thing.’ If the kilesa enter, then the mind isn’t clean. Being free from the defiling things, being unblemished is another characteristic of the void mind. If there’s nothing to disturb it mind is content; if there’s some disturbing factor then it’s not. The mind of the average person is usually uneasy, insecure, so that whenever anything a little odd occurs it’s easily disturbed. If it wasn’t for the defilements the mind would be at peace. The void mind is said to be ‘cool,’ ‘cool’ because of the absence of any ‘heat’ - the defilements represent the ‘heat’ that arises into the mind because of the way we deal with sense experience; it’s because we’re careless when we see, hear, smell, touch, taste, think, imagine or whatever, that there comes to be the ‘heat’ of greed, aversion, and delusion, the heat of defilement, to disturb the mind. If there’s no defilement there won’t be any ‘heat’ either, there’ll be ‘coolness’ instead. Nibbāna means ‘cool.’ Whenever the mind is away from the kilesa it’s ‘cool,’ and even if it’s just a little touch of this coolness, lasting just for a short time, it will still be nibbāna. We could call that ‘occasional,’ or ‘accidental’ nibbāna, which, though it’s just a brief encounter, yet displays the characteristics of nibbāna, of the void mind. Further, the mind stops wandering around. Essentially, it’s the kilesa of taņhā, of craving that makes the mind wander. Craving, desire pulls the mind here and there, causes it to wander after the various sense objects, the forms, sounds, smells, tastes, touches, and the mental objects arising at the eye, ear, nose, tongue, body, or in the mind. There’s a parable in the Pali which illustrates this: go and catch six kinds of animals, a snake that lives in a hole in the ground, a crocodile that lives in the water, a bird that lives mostly in the air, a monkey that lives in a tree, a fox that lives in a cemetery, and a dog that lives in a house. These animals have their own peculiar habitats, catch them and tie them up and they’ll each still be drawn towards their natural homes: the bird towards the sky; the animal that lives in a house towards the house; the one that lives in the forest towards the forest, etc., etc. These are analogies for the mind being pulled around by taņhā, desire arising towards the things we see, hear, smell, etc. Because there’s something pulling it in so many directions the mind isn’t free, isn’t void. When there’s no more pulling then it’s said to be stilled - that stillness, that stopping is voidness. The void mind has clarity, while the confused mind doesn’t, instead it’s disturbed by the kilesa that come in to trouble it. So take out the things that obstruct it’s clarity and it can then function properly, it can do it’s duty. When anything is obstructed, hindered it can’t act properly; the mind is the same, if it has the kilesa obstructing it then it’s not clear, it’s a stupid mind, without wisdom, not a quick or smart mind. Clarity is another characteristic of the void mind. The void mind is also ‘geplī.’ This will probably be a strange word for just about everyone to hear, a word that - although it’s in the Buddhist texts – is almost never heard. ‘Geplī’ is a Pali synonym for the arahant (true human being) and has the meaning of being joined with, or integrated into the ‘whole,’ that is, being ‘complete.’ When the mind’s free it goes to the great voidness. The mind’s usually not free, rather it’s imprisoned, but it can escape from prison, it can become integrated into the all-encompassing void. Voidness is the same thing as ‘geplī.’ Geplī is thus another name for the arahant, the arahant being void, or free. The geplī mind, freed from its bindings and without the usual causes and conditions, the sankhāras, to concoct it, is amatā, deathless, is nibbāna, gone to the other shore. So, voidness is freedom from the kilesa, from the nivarana, and especially from taņhā and upādāna, from craving and attachment. Without the kilesa, without suffering the mind is peaceful, undisturbed, it’s cooled, without ‘heat,’ it’s stilled, it doesn’t wander around like the mind of an ordinary individual, it’s clear, bright, knows all things as it should according to nature, and it’s geplī, attained to the universal voidness. All these are characteristics of the void, the free mind. Try to observe the mind and see if it displays any of these characteristics? Even some will be better than none. The fact is that we do, as is appropriate for us as individuals, have times when the mind has some of the qualities of voidness. We want to give a better understanding so we’ll explain the two concepts ‘voidness’ and the ‘void mind’ a little more. Now, voidness’ is one thing, the ‘void’ mind is another. The mind is void, or free whenever voidness enters it. Thus the void mind and the voidness aren’t the same thing, but they can’t be separated either - if there’s both the mind and the voidness together then there’s the ‘void mind.’ Voidness, if it does nothing is useless, but if the mind has voidness then it isn’t being disturbed by the defilements and experiences contentment, so, as already mentioned, it’s free, smooth, peaceful, it’s cool, still, and bright - it’s geplī. And, because mind really ‘sees’ voidness it’s content with that and protects it, avoids clinging and grabbing at anything and protects the freedom, the voidness, so that it dwells apart from suffering. So, the mind has voidness and is then a ‘void’ mind, the ‘voidness’ making the mind void. There’s contentment because of that. There’s no need for ‘me’ to interfere because contentment is experienced by the mind itself, and if the mind’s content then that’s enough, after all it’s mind that does the thinking, so it’s the mind, still with ignorance, that thinks there is a ‘me.’ Because we can think, then we think that we have a ‘self,’ but it’s really because the mind can think that there is the ‘self’ thought; it’s really the mind that feels it to be so. This is māyā, illusion. A māyā isn’t a reality, it’s an illusion that tricks the mind into seeing something unreal as real. Now, suññatā, voidness, if it’s the ultimate variety, is arranged into four modes and is referred to as ‘jatugotikāsuññatā,’ which means ‘four-peaked,’ or ‘four pinnacled.’ The ‘goti’ part of the Pāli word means a peak, a high place, like a tower for instance, thus jatugotikā means having four peaks. Suññatā then, simply put, has four modes, or kinds. If something is the ultimate it’s called gotika, so the ultimate four-peaked voidness is referred to as ‘jatugotikāsuññatā.’ The first peak, the first mode is that there isn’t anything that could be called ‘me,’ the mind feels that there isn’t anything that could be ‘me.’ Secondly, there isn’t the anxiety usually associated with, or connected to the ‘me’ thought. The first peak is that there isn’t a ‘self,’ a ‘me,’ the second refers to the absence of the associated anxiety. The third peak is that there isn’t anything that could be called ‘mine,’ and the fourth peak is the absence of the anxiety generally connected with anything thought of as being ‘mine.’ Thus, four peaks in two pairs. It’s a matter of ‘me’ and ‘mine’ again - examine and find out if these kinds of feelings are in the mind: ‘me’ and the anxiety that comes with it, and ‘mine’ plus the associated stress - the direct feelings of ‘me’ and ‘mine’ as well as the indirect feelings of anxiety coming from them. Ultimately there won’t be the slightest feeling of ‘me’ or of ‘mine’ or any of the associated anxiety either. It will be absolutely, definitely finished. There won’t be any doubt about it. This will be the highest voidness, the four peaked suññatā. It’s preserved in this way in the Pāli texts. Now, should laypeople know about this subject or not? Think about that, because it’s customary among some groups in Thailand to hold the view that laypeople don’t need to know about this matter. We were criticized by a Bangkok group for teaching laypeople matters, including suññatā, which, they said, were too high for them. Nevertheless, we’re of the opinion that laypeople need to know about suññatā, after all, it’s because they don’t know about it that they have to suffer. Suññatā is useful, helpful to people who have to live in the world. Once, the head of a group of householders went to attend on the Buddha and asked him what would be most useful, most helpful for such as they, for worldly people who have families and still live the worldly life? The Buddha said that suññatā could be of great benefit to them. One layman who was especially famous was Anāthapindika. Both the Buddha and his disciples taught Anāthapindika about other matters but they didn’t speak to him about suññatā. When he was seriously ill and had reached the last days of his life, Sāripuţţa went to visit him and did talk about it, whereupon the seriously ill Anāthapindika bemoaned the fact that for a long time he’d listened to the Buddha and his disciples teach but they hadn’t taught him about suññatā at all, only today had they explained it to him, just today when he was near to death, which meant that he’d only get the benefit of such knowledge for a short time. It was regrettable, but, had he known about suññatā earlier in his life then he could have got more from it. So he expressed his disappointment by moaning and groaning a lot. People should think about that and get to know suññatā well in advance, long before death comes, because knowing about voidness can mean being free of suffering for a good part of life. Coming to know suññatā only on the day of one’s death means getting just a little taste of the good life, so we ought to know about it as early in our lives as is possible, then we’d have the chance to sustain the void, the free mind for a longer time. People in the world have to live with dukkha, in fact they have to live with the mass of suffering more than the clerics do so they have a greater need to know about its quenching. Suññatā, no matter how high flown or deep it may seem to be, is nevertheless a necessary matter for the layperson to know about, after all someone in great pain would need a doctor more than someone with little pain - in the same way, people with a lot of dukkha should know a lot about suññatā, that would be fair and equitable. Now, it’s predicted in the Pali that in the future people won’t be interested in suññatā. Which will spell ruin for the religion. The Buddhist religion will be ruined - when people lose interest in suññatā and turn to some new thing that’s not concerned with voidness, that doesn’t come from the Buddha, it will signify the end of the religion. This ‘new thing’ is described in the texts as something put together by philosophers, by bookish people, something new, some new teaching which will be popular but will be foreign to the concept of nibbāna, something those who come after the Buddha will teach but which won’t be the Buddha’s actual words, so that they’ll explain the quenching of dukkha by another method, not by suññatā, and explain it in such a manner that it will attract people. If people are interested in this kind of thing then they won’t be interested in suññatā, and that will make a nonsense of the religion. When people are more interested in something because it sounds nice, because it’s new, then it’s the beginning of confusion. 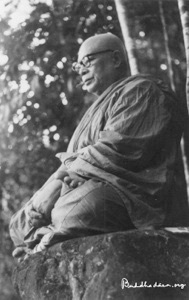 Things that attract foolishly tend to bring forgetfulness of the Dhamma, and when the Dhamma is forgotten the vinaya (monastic discipline) will go the same way. Therefore, it’s necessary that we keep to the basic principle that nothing should be clung to as ‘I’ or ‘mine,’ maintain that one important basic principle as the firm foundation of the Buddhist religion: ‘suññatā’ - nothing should be clung to as ‘I’ or as ‘mine.’ If they hold to this basic tenet then the whole of the Buddhist religion, the Mahāyāna and Theravāda, or part of them, or any branch, offshoot, group, sect or creed will retain knowledge of suññatā - but without it there won’t be a Buddhist religion. So, recognize suññatā as being the heart of the genuine Buddhist religion. If we take out suññatā and replace it with something else then it’s the end, the end of the genuine Buddhasāsanā. The Buddha offers a metaphor for this in the tale of the drum, the sacred drum of a ksatriya tribe in ancient India. The ksatriyas were warriors and this particular tribe had a sacred drum which they couldn’t replace, couldn’t make anew - because it was sacred then they couldn’t replace it because if they did it wouldn’t be sacred anymore. Now, some parts of the old drum began to decay and they replaced these with new wood, but then other parts decayed which they also replaced. They continued on like this, replacing and replacing until the drum no longer contained any of the original wood at all. The point here is that the original and correct Buddhist religion disappears because another matter that isn’t suññatā is brought in to replace it. Suññatā is then lost and there isn’t a trace of it left. Be well aware that if we take suññatā out then we let in the ‘me’ and the ‘mine.’ Taking out the matter of ‘not self’ means taking out aņaţţā and replacing it with aţţā, which will spell the end of the true Buddhist religion. Now, let’s look at the basis of suññatā, that is, at aniccaņ, dukkhaņ, and aņaţţa. Aniccaņ, dukkhaņ, aņaţţā, these three words taken together are suññatā: aniccaņ, impermanent, not stable, uncertain, unsteady; dukkhaņ, abhorrent, hard to bear with, and aņaţţā, ‘not self.’ Take aniccaņ, dukkhaņ and aņaţţā, put them together, and suññatā is born. Suññatā is aniccaņ, dukkhaņ, and anaţţā. Suppose someone ‘sees’ aniccaņ, dukkhaņ, and anaţţā fully and completely, then they’ll ‘see’ suññatā and know that whatever they experience is free, void of ‘self.’ An easy to grasp and clear meaning of suññatā is ‘void of ‘self.’’ When we’re void of the ‘me’ illusion then there can’t be a ‘mine’ either, the ‘mine’ depends on the ‘me,’ so, if we’re free from the ‘me’ that’s enough, the ‘mine’ is gone too. Now, if we have satipaññā, mindfulness and wisdom, we’ll see that everything around us, both within and without, has the characteristic of being suññatā. The void mind has to see everything as void, then it stops, becomes still and doesn’t chase after and cling to anything. We can examine ourselves to see if the mind is inclined to cling to anything at all, even to nibbāna, because if mind is correct, truly correct, it won’t do that. When the mind doesn’t cling, that, then, is the nibbānic mind, the ‘cool’ mind, cool because everything that was once seen as being ‘mine’ is now seen as tathatā, as being just what it is, as being ‘just like that,’ as something that can’t be owned. So, we don’t aim to take anything to be ‘mine’ from the lowest to the highest, the mind is then free and dwells with nibbāna. If the mind takes nibbāna as ‘mine’ then it won’t be true nibbāna. Be well aware that the condition for nibbāna is to let go and not grasp at anything, so don’t take nibbāna to be ‘mine’ because if we do it will be a false sort of nibbāna. True nibbāna can’t be owned by anybody. Don’t cling to anything - that will be enough. Let go! Let the mind reach the void and there won’t be any suffering, the mind won’t have dukkha. Don’t take the mind to be ‘me,’ and don’t take the mental freedom to be ‘mine,’ don’t take the happiness the mind receives because it’s free as ‘mine’ - there’s no need for anything to be ‘mine,’ allow everything to be ‘just like that,’ ‘tathatā,’ ‘just like that,’ just let things be what they are. If mind sees ‘suchness,’ knows everything as being ‘just like that’ then it also knows that it can’t own anything. We’ll need to know this ‘suchness,’ this ‘just like that’ well - if we can understand everything as void then all things will be understood in this way, and then the mind will be ‘just like that,’ the body will be ‘just like that,’ any feelings and thoughts will be ‘just like that,’ everything will be ‘just like that’ operating according to the law of nature, idappaccayatā. All things are ‘just like that,’ just what they are and not otherwise, this is the meaning of tathatā. When mind is free, void it doesn’t take anything to be ‘mine’ because it knows tathatā, knows that all things are ‘just like that,’ are simply natures functioning according to the law of nature, the law of idappaccayatā. Idappaccayatā can mean ‘just like that’ too, for instance: it’s just like that, just like that, just like that (‘just like that, just like that, just like that,’ refers here to the conditions that give rise to suffering being themselves ‘just like that’) and the result is suffering, or it’s just like that, just like that, and there’s happiness. Tathatā, ‘just like that,’ doesn’t refer specifically to happiness or suffering, but indicates the truth of both concepts as well as the true nature of the conditions underlying their arising and ceasing. Thus the conditions are ‘just like that,’ ‘just like that,’ ‘just like that,’ then ‘suffering,’ that which we don’t like, appears, or, it’s like that, like that, like that until happiness, contentment arises. Observe that both happiness and suffering are ‘just like that,’ just what they are according to nature, and that they arise ‘just like that’ in accordance with the law of nature, the law of idappaccayatā. When the mind learns to dislike suffering it no longer goes in the way that allows it to happen, rather it practises to follow that mode of idappaccayatā which doesn’t allow it to occur. It does this because it’s gained the knowledge that there isn’t anything that should be clung to as ‘me’ or ‘mine,’ that when there is clinging of this sort, it - the mind - gets bitten, knows suffering every time, the mind is then chastened by the experience and turns into the way that doesn’t bite, that doesn’t hurt. Thus we come to know the need to walk in the way of correctness, to encourage the correct mode of idappaccayatā, the one that doesn’t cause biting, that doesn’t hurt, so that the mind is free and dwells in the void. Some people don’t understand this matter at all, and prefer captivity, like the captivity coming from indulgence in the delight connected with sexual activity, or whatever. That isn’t being free. People return again and again to the delightful and don’t see voidness. It would be better for us to dwell equanimous - to be above both delight and revulsion would be the proper way to live. At present, if something delights it’s clung to, if it repels it’s clung to; it’s all clinging, all a matter of ‘me’ and ‘mine.’ Dwelling in equanimity, not clinging to anything we’d live in the middle way between the extremes. Consider, for instance, the feelings of being replete and of being hungry, something a child could understand: a child would choose to experience the first of those two, but being full up with food, feeling replete is that peaceful? Feeling full up disturbs the mind, but feelings of hunger disturb the mind too, so it would be better to be in the middle, to be above feeling full up or feeling hungry. Hence, don’t cling to those two feelings and avoid having to experience happiness and suffering. Take to the in-between, that which isn’t either and which won’t bite. Feeling full up isn’t free, feeling hungry isn’t free, feeling full of food is uncomfortable, feeling hungry is uncomfortable – if there’s no ‘me’ to feel full or hungry, that’s freedom, that’s voidness. So, don’t cling to anything, don’t cling to the feelings of being full up, or to those of being hungry, don’t cling to the delicious or to the repulsive. We can see for ourselves how the delightful and the repulsive are able to confuse the mind - they both confuse, but they confuse differently. The mind undisturbed by such things would be a free, void mind, a mind without suffering. Come to understand voidness well, otherwise the opportunity of being Buddhist will be missed, we’ll be Buddhists who don’t know about suññatā, who waste the opportunity of being Buddhist. It’s much the same as wasting life because of not knowing what should be known. This ‘not knowing’ can’t be excused, not knowing suññatā will bring an unfortunate result, so it ought to be known: ‘I didn’t know, please excuse me from suffering’ cannot stand, the law of idappaccayatā won’t allow it; God won’t allow it. Idappaccayatā is an immutable, unalterable law: because there is this, then this can arise, because this isn’t, then this isn’t going to be either; it goes along in this way all of the time. The law of nature is in this body of ours: because there is this, this arises, so, should we do the wrong thing then some physical disorder, some form of dukkha will happen immediately. It’s because we cling to things as ‘mine’ and don’t allow them to go along according to the law that we get ‘bitten,’ that there has to be mental suffering. If we’re to avoid suffering we’ll need to acknowledge idappaccayatā and learn to behave accordingly, that is, come to see that, whatever it is, it’s tathatā, it’s ‘just like that,’ so that we aren’t deceived into clinging to anything. This is to know ‘voidness,’ when the mind doesn’t cling and is freed from all suffering. The void mind’s exceedingly sharp and functions entirely according to the law of idappaccayatā. The void mind is peaceful, complete, does everything in line with the law of nature. So, if we want to be free from any form of suffering then we should dwell with a void mind, we should ‘abide in the void,’ abide in the suññatāvihāra, don’t allow any sense contact to happen carelessly, with a mind that isn’t free. So, whether standing, walking, sitting, lying down, or whatever, do it with a void mind, do it without the feeling that anything is ‘mine.’ People have to work in some way, almost without exception everybody has to work, so, when we work we should do it with a clever, bright mind, a void mind, and not with a mind that’s ponderous, heavy - don’t work with a tense mind, a clinging mind, do it with a clear, a void mind. When resting do it with a free mind because if the mind isn’t free, isn’t void there’s no real rest and relaxation. When we do anything: working, meeting with people, relaxing, and so on, we do it with a free mind; if the mind isn’t free, if it’s irritated, disturbed by something, it suffers. Even when dealing with a troublesome matter the mind should remain still, void. We’ll need to do our best when we fall ill, when we’re sick it’s most important to be sick with a free mind because then we’ll recover quickly, or, if we should happen to die, we’ll die well(!) If anyone would recover from illness quickly then they should keep the mind void, free from clinging during the time that they are ill, being aware that the malady is really ‘just like that,’ just ‘thus.’ Sickness is tathatā, ‘just like that,’ and doesn’t really have any power to oppress, to ‘bully’ the mind. Sickness is something quite ordinary, not anything we should be afraid of, not anything capable of creating suffering. If we recover from sickness it’s ‘just like that’ too, there’s no undue mental disturbance, it’s not something that needs to trouble or please the mind. So, if we’re ill then we let it happen with an ordinary mind, a steady mind, without the ‘me’ and ‘mine’, without the ‘me’ who’s sick, without the ‘me’ who’s going to die, etc. Work with a void mind, relax with a void mind, meet people with a void mind, experience deadly illness with a void mind, die with a void mind - if we should die then let the end come with a void mind, without the ‘me’ and ‘mine,’ and there won’t be any suffering at all. There’s a saying that most people nowadays don’t understand: ‘there’s sickness, but there isn’t anyone who’s sick’ – there’s the sickness but there isn’t anyone who experiences it. We believe that ‘I’m’ sick, ‘I’m’ going to die – ‘me,’ when in truth this ‘me’ doesn’t exist. It sounds odd: there’s the sickness, but there isn’t anyone who is sick; there’s dukkha, but there isn’t anyone who experiences it - there’s the feeling of dukkha, but there isn’t anyone who suffers it, or anyone who owns it, there’s just the mental feeling. There’s the doing of the many and various things but there isn’t anyone who does them, in reality they’re induced through the law of idappaccayata. There’s walking, but no-one walks; there’s walking to the temple, for instance, but there isn’t anyone who does it, because the ‘walker’ isn’t a person, it’s a stream of idappaccayatā. If one can see in this way it’s called seeing suññatā. Thus, try to practise so that the mind doesn’t cling to anything and there won’t be any problems, instead there’ll be the coolness, the quenching of suffering - but there won’t be anyone who is cooled, quenched. Nibbāna is the ultimate voidness, free from suffering, void of ‘self.’ Nibbāna may be the ultimate voidness, but there’ll still be the feelings normal for one who’s alive and has the senses. Like the feeling arising from anything that comes into contact with the body in whatever way – there’ll still be these kinds of feelings, but as there won’t be any clinging then there won’t be any suffering, even when there are the feelings associated with hunger, sickness, tiredness, or whatever. Life will still go along, the body will still function and must feel hunger, thirst, desire to defecate and urinate, and so on and so forth, hence there’ll still be feelings because the body will still be sensitive, but there won’t be a ‘me’ who does the feeling, so there won’t be any suffering – only the disturbances natural to a living being. If hunger, thirst, pain, desire, eating, excreting etc., produces a troublesome feeling then it’s a natural event, just recognize that it’s idappaccayatā, happening naturally, and don’t make it into dukkha, don’t cling and allow the kilesa to make it into suffering. We should practice like this. Suññatā is necessary for one who would be dukkha-free; anyone wanting to be free from suffering will have to dwell in the void, not clinging to anything as ‘me’ or ‘mine,’ with a mind in which the defilements don’t arise, and suffering doesn’t happen. Knowing this we can try to practise so that we don’t waste the good luck that’s brought us into contact with the Buddhist religion and with the opportunity of ending suffering. Suññatā, or a life lived with suññatā, is a matter that Buddhists, laypeople included, need to know about. Therefore, let’s help each other to learn about suññatā, help each other to practise it and get the result, the benefit, until we’re able ‘abide in the void,’ to live life with a free mind, a void mind, minus the nervous diseases we’re prone to now. At present people the world over suffer from nervous disorders because they aren’t suññatā, take a look, the human world’s a nervous place.